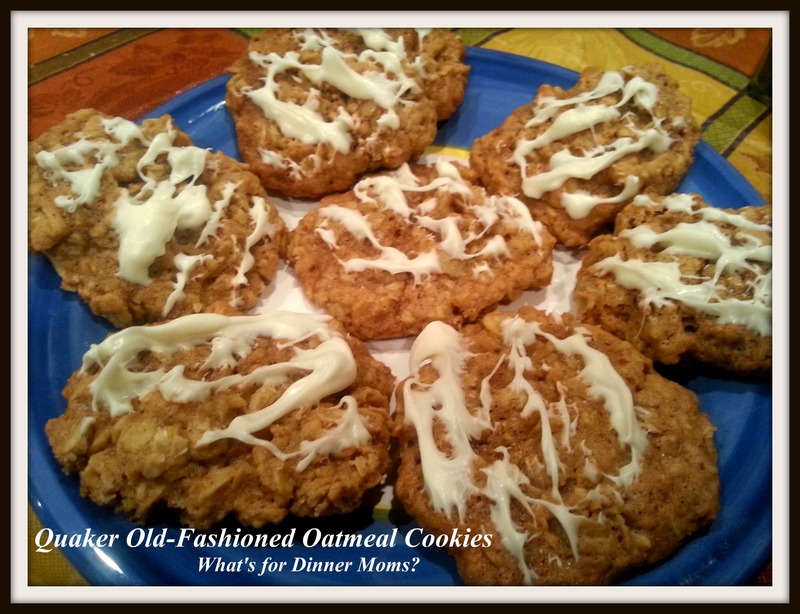 Quaker Old-Fashioned Oatmeal Cookies – What's for Dinner Moms? These cookies are a favorite in our house. I use the recipe for Quaker’s Best Oatmeal Cookies from Quaker Oats.com just like my mother used to make them off the back of the oatmeal box. I almost never bake but when I do I want a recipe I know that will turn out each and every time. I love that I can customize these cookies for each child. My daughter prefers them plain. My son wants his with milk chocolate chips. I prefer mine with Craisins and white chocolate chips. For Christmas this year we added a white chocolate drizzle to the cookies. Whatever you add these are easy and delicious! In large bowl, beat margarine and sugars until creamy. Add egg and vanilla; beat well. Add combined flour, baking soda, cinnamon, salt and nutmeg; mix well. Bake 8 to 9 minutes for a chewy cookie or 10 to 11 minutes for a crisp cookie. Cool 1 minute on cookie sheets; remove to wire rack. Cool completely. Store tightly covered. Note: We melted white chocolate discs in the microwave and then drizzled it over the cooled cookies to add a bit of color to the cookies. I was just looking at this quaker oats recipe today and now it’s on my feed, I think it’s a sign that I need to make these! It’s good with Craisins and white chocolate too if you like them. The basic recipes I have found to be the best! Yummm I need to try these. Thanks. This is one of those grandmotherly type recipes that I love! yes I have found these to be some of my favorites and the ones I use all the time. I also add things that my kids like! I will try this one for sure! I like them quite a bit too. Especially with chocolate in them!